Tonight I decided that I would do some gardening after work. For once I had enough energy after work and it was sunny, but not exactly warm. My task was to see how my fuschias had fared over the winter. I never do anything special to them to get them through but rather leave them to their own devices and replace those that don’t make it. 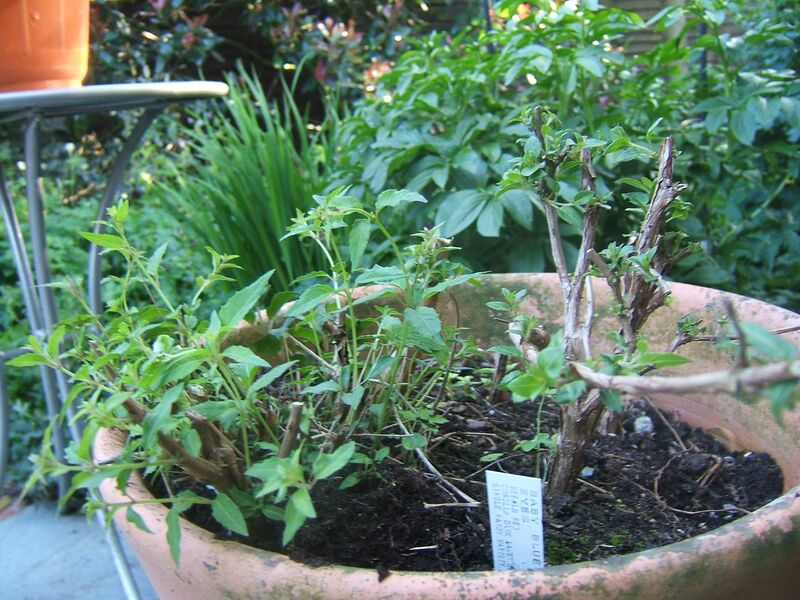 I had noticed greenery in the pot but wanted to investigate further. So, I set to removing the dead bits of fuschia to see what remained. I tend to use small scissors for this job so that I don’t remove the new growth by accident. Eventually I worked out that all the plants in this pot had survived, but that a number of hardy geraniums had also decided that this was a great place to settle. 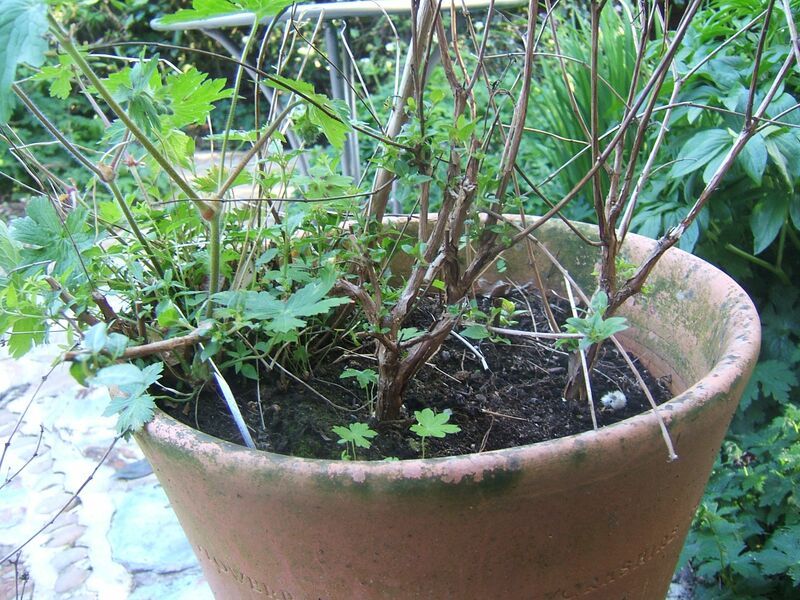 Whilst I love the geraniums, this pot is not the right place for them. I don’t have the space to nurture the very small seedlings and so decided to discard them, but there were two that were large enough to be considered as plants and so I decided to transplant them. I therefore selected a new location for the geraniums, got my trusty trowel and kneeler to break ground. My mistake was that I had the two plants beside me on the ground. The very second that my trowel made contact with the soil, in swooped Anya and raced off with one of the plants! Anya is now 17 months old and well into the wayward teenager phase. On top of this, she has had the garden to herself throughout the excessively long winter period and really doesn’t yet understand that this is my garden! Depite having had a run in the forest only a couple of hours before, Anya suddenly became a mad thing racing round and round the garden – jumping through beds (now I know why plants aren’t growing in that spot!) and storming past shrubs. There was obviously not a chance of any command I threw in being listened to, let alone obeyed. For a second she stopped, putting the plant on the ground in front of her. I took a step toward her and she picked up her prize again and raced off in the opposite direction! Then I thought that I aught to be videoing this behaviour to show you that all of us have this sort of issue to deal with and also how well the garden was standing up to the onslaught. Luckily I had my camera close by having taken the previous photos. I changed it to the video setting and then as suddenly as the madness had started, it stopped. Anya hadn’t heard that sound before and so it was much more interesting than the plant. Suddenly I had Anya’s full attention, so she and the others went into the house while I finished my planting. I have no idea where the plant she absconded with ended up. There is little doubt that what remained would not have made a successful plant. This little episode has reminded me how much work I have to do to teach Anya how to behave in the garden, but at least she and the garden came out of the whole thing unscathed :).